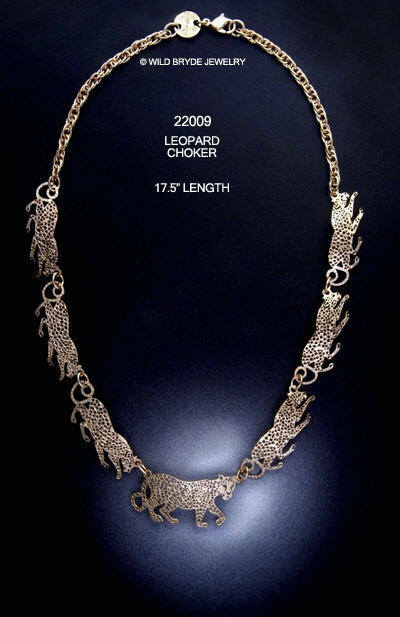 Wild Bryde Leopard Choker 17.5 inches The jewelry itself is etched in recycled brass and each piece is hammered by hand using a special plannishing tool. This hand-hammering technique gives the jewelry subtle facets which catch the light, and makes these pieces attractive and distinctive from near and far! The final stage is the plating process. Wild Bryde uses a gold-plate and/or a rhodium finish (a special, non-tarnishing alloy that looks like silver). Earwires are 14k goldfill or sterling silver. Wild Bryde Jewelry is made entirely in the USA.